Imagine laying in bed. As your dog paces around trying to get comfortable for the night. He strolls across your tile floor to his bed. These are the thoughts in my brain as I think about the sound of dog nails on the floor. Like fingernails on a chalkboard. A fork scraping a plate. Styrofoam squeaking. The Raven rapping. This ear-splitting sound is enough to make any dog lover cringe. My goal with this series is to stop the madness. To bring the peace of paws to the discord of dog nails. Dog’s nails serve a purpose by providing a way for dogs to dig, grasp things more tightly, and claw at predators or food. Perhaps in the wild, it makes sense for wolves to have longer claws. They are catching and killing prey, eating it, and traveling through rugged terrain in order to find that prey and survive. For wolves long nails makes complete sense. However, let me ask you a question. When was the last time your dog needed to climb a hillside in order to track down and kill a small animal in order to eat? I’m going to take a stab at this and say, um, never. 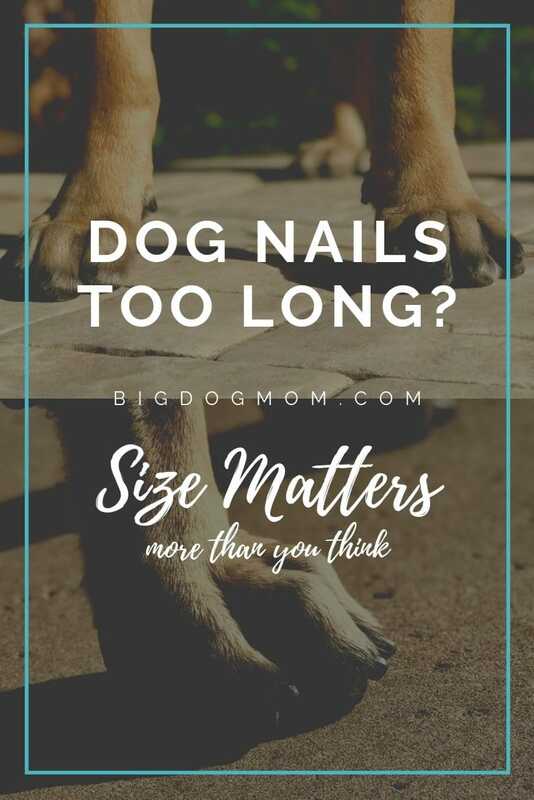 So while, yes, dog nails do have a purpose, I am going to share with you why I believe size or length does matter. Why shorter is better when it comes to dog nails. Is there such a thing as nails being too short? What you can do today if your dog’s nails are too long. 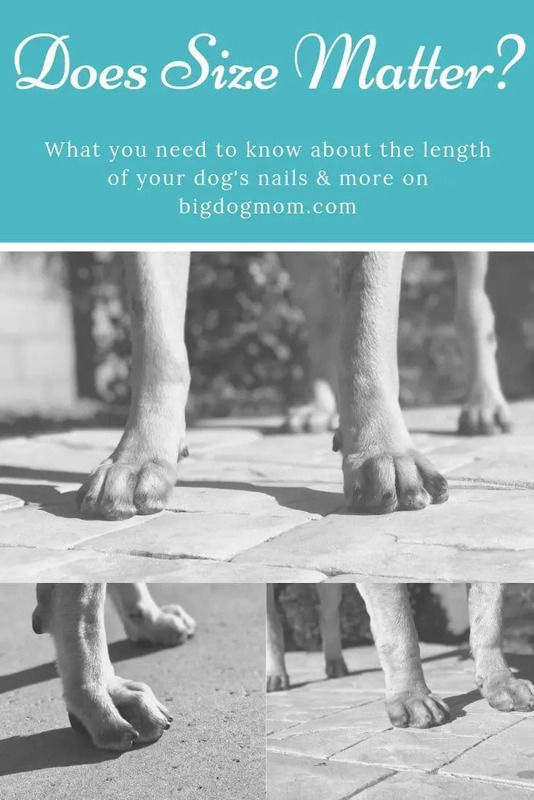 There are three primary areas to focus on when we think about the consequences of dog nails that are too long; orthopedic, postural, and aesthetic. Let’s cover each one of these in detail. Put simply, extremely overgrown dog nails can cause painful feet. Very painful feet in some cases. When a dog’s toenails contact hard ground, like a sidewalk or your kitchen floor, the hard surface pushes the nail back up into the nail bed. This either puts pressure on all the toe joints or forces one or more of the toes to twist to the side causing extreme pain while running, exercising or even walking. It is no wonder so many do fuss when you touch their feet. There are several factors at play when it comes to movement. First, is the issue of pain. Dogs, like humans, will very naturally try to avoid pain by compensating their movement in an unbalanced way in order to prevent it. So think about the last time you had a rock in your shoe. Did you continue to walk or run normally, fully planting your bare foot on the rock? No, of course not. Stop moving and take your shoe off to get rid of the rock. Unfortunately, our dogs do not have the luxury of shoes to avoid the rocks (nails) that are causing them pain. So they compensate their movement in an unbalanced way (by limping or favoring certain limbs) which can lead to overused muscles and eventually overused joints. Over time this can result in lameness especially in their hind limbs, making it difficult to jump in cars, climb stairs and even hard to get up from lying down. Secondly, dog nails that are too long can hamper a dog’s ability to walk or run efficiently. 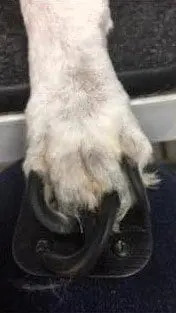 They can turn a sound paw into a splayed foot and reduce traction, and they can cause deformed feet and injure the tendons over an extended period. As the long nail hits the ground, the pressure puts force on the foot and leg structure. This interferes with the dog’s gait and as the nails continue to grow, walking will become awkward and painful. Compromising a dog’s weight distribution (the imbalance I mentioned above) and natural alignment can leave dogs more susceptible to injuries and make walking and running difficult and painful. Let’s go back to my rock in the shoe example. Imagine you had a rock in your shoe and there was no way to get rid of it. You were forced to keep that rock in your shoe for every jog for the rest of your life. And all the while you are bending your foot and your leg to avoid the pain of stepping on the rock. The imbalance in your gait would most certainly lead to injury if the cause of the imbalance were not addressed. For dogs with long nails, this is their reality. Infections can stem from a few different things as it relates to dog nails that are too long. Long nails can catch the carpet, plants or furniture resulting in the entire nail potentially ripping out of the paw making the paw prone to infection. In severe cases, a dog’s nails can curl under and grow into the pad of the dog’s paw causing pain and infections. These types of ingrown nail problems are most common on the dewclaws. Long nails are just more susceptible to nail infections that can result in permanent defective nail growth. For many with dog nails too long, surgery may be the only option for them in order to reduce the orthopedic consequences associated with neglectful nail care. Surgical intervention for long nails is an utterly unnecessary expense that can be easily avoided with routine nail trims and prioritization of this often overlooked aspect of healthcare for dogs. Are your dog’s nails too long? Do you fear hitting the quick? If so, download your FREE Quick Starter Guide, an A to Z guide all about the dog nail quick. An extension of the direct orthopedic issues, is the impact they have on a dog’s posture. Dogs with long nails will naturally tuck their hind legs forward and front legs off of the natural perpendicular of proper posture. In other words, when viewed from the side, a dog with extremely overgrown nails doesn’t plant his feet perpendicular to the ground perfectly stacked under his shoulders and hips. This would be the most obvious manifestation of postural deficits caused by nails being too long. In addition, like all terrestrial animals, essential information about a dog’s environment is transmitted by his paws. This foot-brain connection can be negatively impacted by long nails. 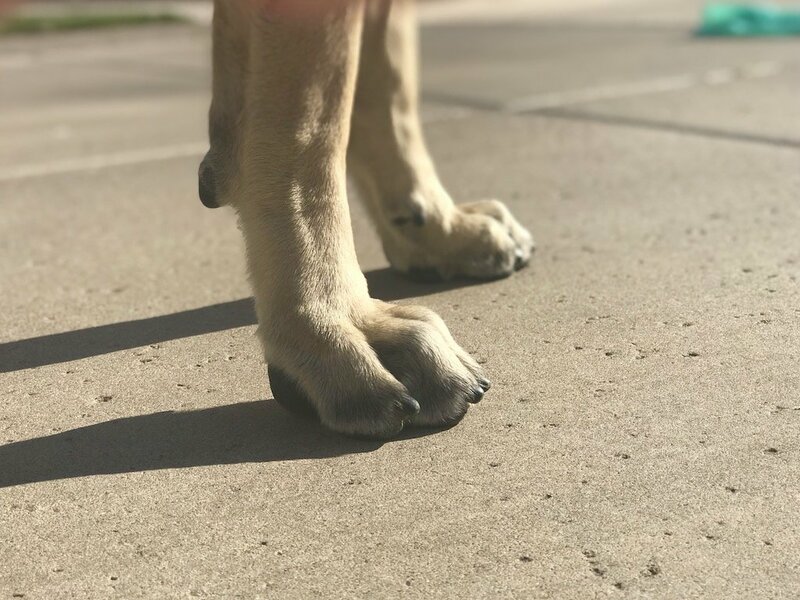 Overgrown dog nails are essentially interfering with the dog’s ability to stand fully erect, to rely on his feet to give him information about his environment, and to move with confidence. The message sent to the brain with every step a dog takes is erroneous until the overgrown nails are cut to the proper length. In How to Cut Dog Nails Stress-Free And Have Your Dog Actually Enjoy It, I shared that to me, long nails completely ruin an otherwise beautiful paw. I know many breeders who spend time thinking about and planning breedings with paw structure and conformation in mind. The conformation standard as it relates to paws will be different for each breed. But no matter what the breed standard is, long nails will ruin a genetically perfect paw. 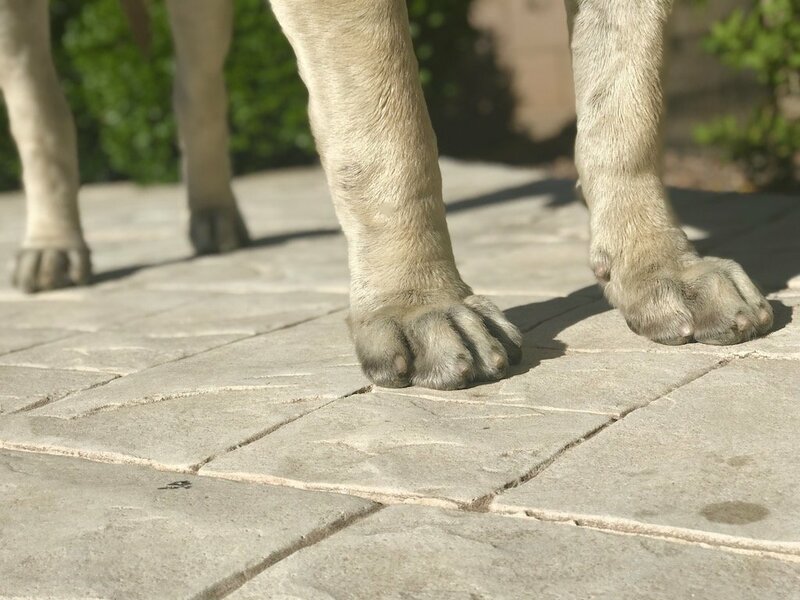 Mastiffs with long nails end up with flat-looking paws with splayed toes. This is not a genetic fault by breeding. It is the result of years forced to maintain a 200 pound frame on toenails that are too long. I will confess. I am obsessed with dog nails. They are the first thing I look at when I meet a dog in person or see a picture of one. And they are the first thing I compliment on the rare occasion I see a perfect paw with well-maintained, short nails. The quick is the blood and nerve supply for the nail, which when hit during a trim, can bleed and cause pain for the dog. Outside the scope of this post is to go into great depth about the quick and how to cut your dog’s nails in such a way as to avoid hitting it. For a detailed examination of the quick (WHAT it is, HOW to avoid it, and WHAT to do if you hit it), download your FREE Quick Starter Guide. However, for now, understand that the quick grows along with the nail. The longer the nail, the longer the quick. When your dog’s nails are too long, you end up with the compounding problem of the quick being too long. This causes nail trims to be filled with frustration and anxiety. Frustration based on the lack of progress made with each trim. And anxiety over hitting the quick that now extends the length of the nail. Maintaining your dog’s nails at the proper length can eliminate all of that stress. Stick with me and I can show you how. Can a Dog’s Nails be Too Short? As referenced above, the purpose for which dogs have nails (claws) are in large part not as relevant for our domesticated dogs as it is for their wild relatives. Because of this, I do not believe a dog’s nails can ever be too short when maintained properly with weekly trims. I hope you hear the caveat in what I just wrote. There are some breeds of dog for whom nails still do provide a very real function. For breeds (like the Siberian Husky, Dachshund, Basset Hound, Jack Russell Terrier, or Beagle) who are bred AND currently used for activities which require them to dig either to hunt down prey or to cool or warm their body, I can see the length of the nail being of value. Now, let’s not go overboard here. Even these dogs need short, well-maintained nails. However, since the dog would be actively using the nails for a specific purpose, not just for digging up the backyard flowers, use your judgement with respect to the appropriate length. So, what is a dog owner to do? You have a dog that you know has nails that are overgrown. His incessant clicking on the tile floor is driving you mad and you know you have to do something. Perhaps you have tried to cut them yourself, unsuccessfully. Or maybe you rely on a groomer or vet tech to cut them, but you know your dog’s nails are still too long. Or perhaps you can and do cut your dog’s nails, but due to your anxiety about hitting the quick, you fail to make significant progress in shortening them. If you resonate with any of these scenarios, here are three next steps you can take today to get on a path to cutting your dog’s overgrown nails without fear or frustration. What to do if you hit the quick. 2. Join me on Friday during our Facebook and Instagram LIVE. During this workshop, I will be illustrating the effect of long dog nails with a few simple exercises you can do at home. 3. If you have a friend with a dog who has ground clicking claws, please share this with them. Seriously. Sometimes it is difficult for us to see reality even when it is right in front of our face. Call it denial. Or call it rationalization. Whatever the reason, your friend and his/her dog needs help. And I would love for this series to serve that purpose. Are your dog’s nails too long? Tell me about your nail cutting experience in the comments below. What have you tried that hasn’t worked to shorten them? What is your primary struggle now as it relates to your dog’s nails? I’m afraid you’d cringe at the site and sound of Ginger’s nails! We are working on it… thanks for all your great advice in this article. Even though Bear is not so difficult with his nails, I’ve been able to see an improvement in his calmness by using your techniques. But that dang quick… I’m always afraid of hitting it. I am so proud of all the work you are putting into both dogs. Remember this is a long term investment. Once you are able to see success with one dog, you will be able to apply the same knowledge and experience to the others. I understand how much so many people fear the quick, but I will tell you, by following my method, you may never hit the quick again. The progress is slow and steady – at the dog’s pace. This is the only way to do nails in my opinion. Keep up the great work. I’m here when you need me.